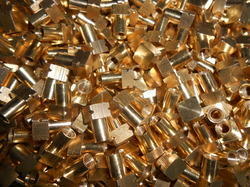 We are prominent names in the industry in offering a wide range of Brass Insert. Owing to their sturdiness, excellent resistance properties, and dimensional accuracy, these inserts are highly demanded. Apart from this, these are used in Automotive, Instrumentation, Telecommunications, Plastics Assemblies, Injection molded plastics components, Rotomolded Components, and many more fields. We are engaged in presenting an extensive range of Threaded Inserts to our clients. These inserts can be developed exactly as per customer Drawings, Specification, Design, Samples & Requirements. These offered ranges are used in Instrumentation, Automotive, Telecommunications, and other Plastic Cases Assembly. Additionally, customers can avail these inserts in bulk quantities at competitive prices. Instrumentation, Automotive, Telecommunications, and other Plastic Cases Assembly. In such cases the length of insert is very important for proper closing of moulding die. We maintain length of such inserts within tolerance of -0.05mm. Thread Size Starts from M1 to M50, BA, BSW, BSPT, and BSF & American Threads like UNC, UNF, UNEF, and NPT are also available as per custom requirements. Straight, Diamond, opposite diagonal etc. are the knurling options available to give solid gripping to Molding applications. Backed by our vast industry expertise, we have come up with Brass Knurling Inserts for our priceless customers. The offered inserts are designed as per the varied customer requirements and are known for their dimensional accuracy. Premium grade brass is obtained from established vendors for manufacturing these inserts. 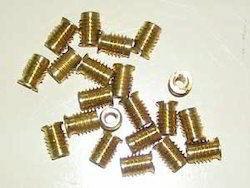 Offered brass inserts are reasonably priced. Being the foremost organization, we rule the market by offering an exclusive collection of Brass Inserts For Plastics Molding. The offered products are designed by keeping in mind the set industry norms. These inserts are available in various types and styles to suit virtually any insert application in plastic. Our offered array is highly appreciated among our clients for its attractive features. Inner Diameter (I/D) after Threads with very close tolerance to prevent unnecessary flush to enter into the brass inserts. Both blind and through brass inserts are available with no minimum Qty. We have established ourselves as an eminent name in offering a vast array of Brass Moulding Inserts. This product is manufactured using only high-quality input factors as per the preset industry norms. Also, our customers can avail these inserts from us at very cost effective rates. Our offered products are highly demanded by the customers due to their perfect sizes. 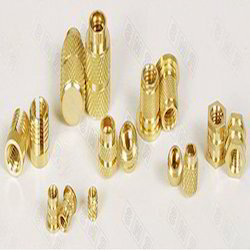 We are an accomplished organization which has gained name and fame in providing Brass Threaded Inserts to the customers. Manufactured using the best quality of brass these inserts has high sturdiness, long life and resistance to chemical reactions. Moreover, we offer these products in various sizes in order to fulfill the clients’ requirements. As a customer focused organization of the industry, we are offering a wide assortment of Threaded Inserts to our valuable customers. Offered products are widely demanded in various industries. In addition to this, to cater the different requirement of our huge client base, we are providing these products as our client detailed needs and requirements at very leading prices. 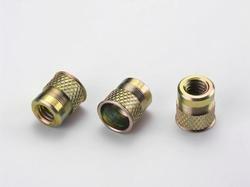 We hold expertise in offering the wide gamut of Brass Knurling Inserts in the industry. The offered inserts are designed as per the varied customer requirements and known for their dimensional accuracy. 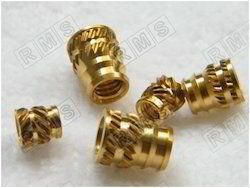 Premium grade brass is obtained from established vendors for manufacturing these products. Apart from this, offered inserts are reasonably priced. 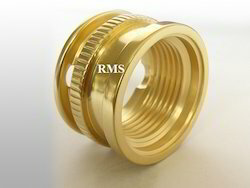 Leveraging our rich industry expertise, we have come up with Brass Roto Moulding Inserts for our priceless customers. The offered inserts are designed in compliance with the industry standards, using high grade brass and sophisticated technology. Owing to our large production capacity, these inserts can be availed by the customers in bulk quantities. 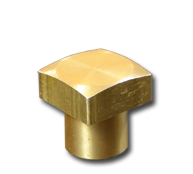 We are among the industry veterans, engaged in offering Brass Hex Inserts to our revered customers. The offered inserts are regarded for their dimensional accuracy and are made available in several specifications to meet the varied requirements of the customers. Characterized by optimal pullout resistance, these inserts are much appreciated. We are among the renowned industry players, engaged in manufacturing and supplying Aluminum Inserts for our esteemed customers. High-grade aluminum is procured from established vendors for manufacturing these inserts. With their flawless design and dimensional accuracy, these inserts are highly demanded by the customers. We make these inserts available at competitive prices. We are among the prestigious manufacturers and exporters of Brass Rotational Molding Inserts in the industry. The offered inserts are made available in several sizes and grades of material to fulfill the varied requirements of the customers. 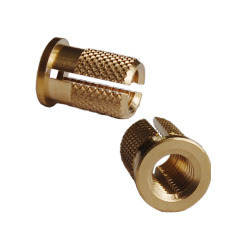 These inserts are dimensionally accurate and highly resistant to corrosion. Customers can avail these inserts in bulk quantities at market leading prices. Any kind of Brass Inserts, Brass Rotational Moulding Inserts can be developed and supplied exactly as per Customer Specifications & Requirement. We are among the industry veterans, engaged in manufacturing and supplying Brass PPR Inserts for our valuable customers. The offered inserts are made available in BSP and BSPT threads in both standards and customized options. Customers can avail these inserts in chrome, brass and nickel finish, depending upon their requirements. The offered inserts are reasonably priced. Our Roto Molding Inserts are mechanical joining systems providing high load-distributing anchorages for thin or thick wall plastic moldings and other substrates requiring secure mechanical joining. Natural, Nickel Plated or any coating as per customer specification. Any kind of Brass Inserts, Brass Rotational Molding Inserts can be developed and supplied exactly as per Customer Specifications & Requirement. Brass Square Inserts Specifically designed for the Rotational Molding process, this versatile insert provides exceptional torque and pull-out resistance. Unique Square design allows to be used with fibrous materials where the fibers would normally block the flow of the plastic material around ordinary diamond knurled inserts. Inside diameter held to strict tolerances for a smooth, tight fit on locating pins. 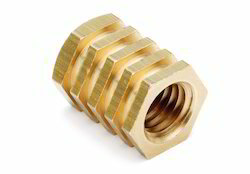 Brass Hex Inserts Specifically designed for the Rotational Molding process, this versatile insert provides exceptional torque and pull-out resistance. Unique Hex design allows to be used with fibrous materials where the fibers would normally block the flow of the plastic material around ordinary diamond knurled inserts. Inside diameter held to strict tolerances for a smooth, tight fit on locating pins. Our rich domain expertise has led us to manufacture and supply Round Brass Inserts to our valuable customers. The offered inserts are designed as per the applications they are to be used in and are highly durable. Premium quality brass is procured from renowned manufacturers for manufacturing these inserts. Offered inserts can be availed by the customers in bulk quantities. 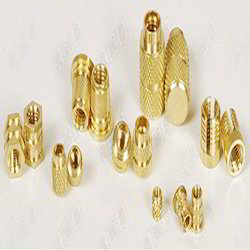 Clients can avail from us high-quality Brass Inserts for Plastics Molding. The offered product is designed by utilizing premium quality material and progressive technology. Furthermore, the offered inserts have been specifically designed for molding applications and can be provided in several specifications, depending upon the customer’s needs. 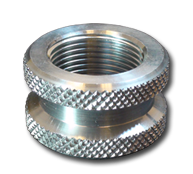 We are manufacturing the round knurled inserts, hexagonal inserts and square inserts as per custom design. 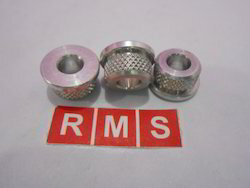 The inserts are available with diamond, straight or unidirectional Knurling. 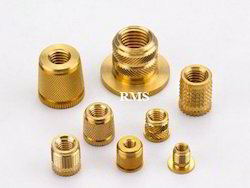 We are the leading manufacturer of Brass threaded inserts for plastics Industries, Communication equipments, Automotive Industries, Electrical & Wiring Device Cases etc. 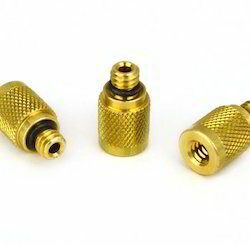 We offer a full line of brass inserts for all methods of installation, including: ultrasonic, heat, thermal, press-in and mold-in. 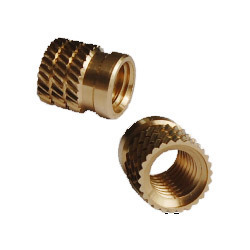 Although we produce various brass inserts as per custom design & specification, we have standard series of Threaded Inserts such as Straight Hole, Blind (Closed bottom), Collar Inserts, Ultrasonic, Press in, Tri Slotted Inserts etc. Around 3.5 million pieces of variety of brass inserts are manufactured by us per month to cater the voluminous demand of all our giant OEMS around the globe. Any kind of special Brass Insert can be developed and supplied exactly as per customer Drawings, Specification, Design, Samples & Requirement. 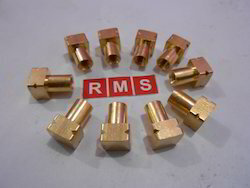 Brass molding inserts for injection and roto molding. Molding inserts or molding turned parts are also available as per customer's design and samples. 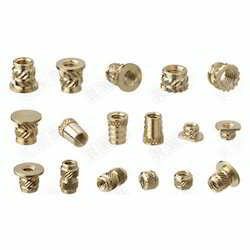 Any kind of Brass Inserts, Screw can be developed and supplied exactly as per customer specifications. We manufactures Brass Square Inserts as per customers drawing and specification. 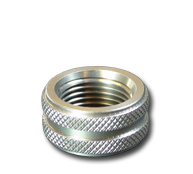 We manufacturers of all types of Knurled Nut as per drawing and specification. 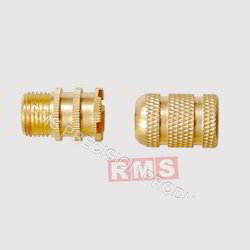 We manufacturing and supplying all types of Custom Brass Inserts as per drawings and specification. 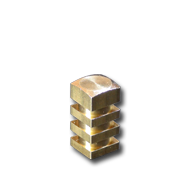 We have trusted names in the industry in offering a wide range of Brass Press in Inserts. The offered inserts are compatible with thermoplastic materials and comprise of slotted sides. With their high corrosion resistance and durability, these inserts are highly used in various fields like Instrumentation, Telecommunications, and other Plastic Cases Assembly. Offered inserts can be made available in bulk quantities. 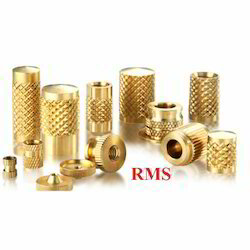 Our organization is well known in the market for providing a broad assortment of Brass Diamond Knurling Inserts to our clients. These products are assembled using optimum quality components. Apart from this, one can purchase these products at the reasonable price from us. The offered inserts provide an outstanding grip and comprise of a diamond pattern knurling. Owing to our rich domain expertise, we have come up with Brass Ultra Inserts for our priceless customers. These inserts are specifically designed for plastic and light loading applications and are highly demanded in the market. The offered inserts are ideal for heated press-in and ultrasonic installation and are made available with or without head. 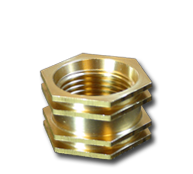 We are among the celebrated manufacturers and exporters of Brass Expansion Inserts in the industry. The offered inserts are designed keeping in mind the requirements of different applications and fulfill the diverse requirements of the customers. These inserts can be used in plastics and timber and are highly demanded in the market. Offered inserts can be availed in bulk quantities. 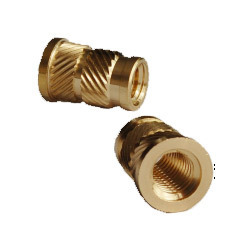 Our threaded brass inserts for wood have an external thread which is suitable to wood where no thread is available. These inserts have an external thread with knife edges which grip deeply into the wood and keep the insert securely in place. The internal thread is a metric, inches, BA or any special thread which allows numerous fasteners to be used. We manufactures Brass Square Inserts as per customers drawing. It is widely using in roto moulding components. 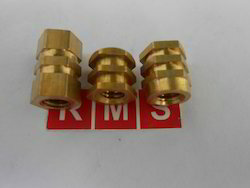 We manufacturers Brass Hex Inserts as per customers drawings. 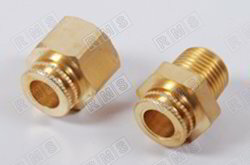 Brass Hex Inserts are widely used in roto moulding platics components. Any kind of Brass Rotational Molding Inserts can be developed and supplied exactly as per Customer Specifications & Requirement. We manufacturers Brass Square Inserts as per customers drawing. its are widely used in roto molding plastics components. Any kind of Brass Rotational Molding Inserts can be developed and supplied exactly as per Customer Specifications & Requirement.